After the death of her mother, Clare Weissenberg inherited her father's suitcase of German letters, documents and photographs. As she was going through the materials she came across a mention of a place called the Kitchener Camp. Not being familiar with it, she dove into further research which started her on a journey to what ultimately became the Kitchener Camp project. With the rise of the Nazis in Germany, European Jews founds themselves spread across the world. Some were relocated to concentration camps. Others escaped out of Germany, resettling in other countries. One place that Jewish refugees fled was the Kitchener Camp in England. The camp was created in early 1939 near Sandwich, Kent by influential Jews in England to house German, Austrian and Czech male refugees fleeing Nazi persecution. In all approximately 4,000 people passed through the camp between February 1939 and May 1940 when it closed. Through her research Clare Weissenberg discovered that her father had been a refugee at Kitchener Camp. Clare started to connect with other descendants of Kitchener Camp refugees. In the summer of 2017 a gathering of Kitchener Camp descendants was held near the site of the camp in Sandwich. From that day came the idea of a website for descendants. Kitchener Camp. Photo courtesy of Peter Heilbrunn. The unique thing about the camp was that inmates could only be accepted if they could show they were in transit to somewher else. Many left England for North and South America, but most went predominately to the United States. While the website has records listing all the inmates in September 1939, there are no records showing who left England and where they ended up. The Kitchener Camp website has been created to provide details of the men who passed through the camp. On the website you'll find a list of names, photographs, documents, letters, memories and much more. The website, originally created by Clare Weissenberg, will soon be run by the Weiner Library in London. In addition to finding details about your ancestor - you can help! If your ancestor passed through the camp, the Kitchener Camp project would like to hear from you. You can share photos, letters, memories and what happened to your ancestor after he left the Kitchener Camp. Read a detailed announcement with a call for documents. Kitchener Camp Registration Card for Hugo Heilbrunn. Photo courtesy of Peter Heilbrunn. On the website you'll also find group photos of the men while staying at the camp. To learn more about the Kitchener Camp project and its resources visit www.kitchenercamp.co.uk. You can read the book Four Thousand Lives: The Rescue of German Jewish Men to Britain, 1939 by Clare Ungerson. To start tracing your own Jewish ancestry watch these classes from the Legacy Family Tree library. Many thanks to Clare Weissenberg and Peter Heilbrunn for their resources and thoughtful assistance in the creation of this article. There are some U.S. states that give researchers more problems than other states. Lately I've been researching my Pennsylvania ancestors. Before 1900, Pennsylvania gives me a lot of trouble. Here's an example of one of my problems. In 1857 my 3rd great grandfather, Simon George, died Indiana County, Pennsylvania. At least we can say that he disappears from census and other records by 1860. But Simon is not my problem, at least not for today. What bothers me is that Simon left behind a 33 year old wife, Lydia, and four small children: Jacob, age 10; Sarah, age 8; Ann, age 6, and Susan Jane, age 5. I can't find any trace of Lydia or her children in the 1860 US Federal Census. My mind doesn't seem to want to let go of missing children so here's f I'm doing to find them. I started with what I do know for sure - that the family lived together (Simon, Lydia and the first two children born by 1850, Jacob and Sarah) in Brush Valley, Pennsylvania in 1850. It would make most sense to start by searching the 1860 census for the family in Brush Valley also, but 10 years is long time for a mother with four young children. I carefully looked for every Lydia without a surname (in case she got remarried) and with four children matching the names, Jacob, Sarah, Ann and Susan. No results. Strike one. I also know that Jacob, my 2nd great grandfather, lived in Burrell, Indiana, Pennsylvania in 1870 with his new wife. Perhaps the family had moved to that town which is the next town over? I searched for every Jacob George in Burrell and all of Indiana County in the 1860 US Federal Census. Strike two. Next, in an attempt to find different information, I decided to use a different database site. In an unusual move I chose FindaGrave.com. My thought was, if I could locate one of the family members in a cemetery maybe by searching the same cemetery I could find the rest. FindaGrave has a handy feature that lets you search the same surname in the same cemetery making searching very easy. You can also then switch over to searching any name in the cemetery. Jacob George, the son, died in 1909 and is buried in Greenwood cemetery in Indiana, Indiana County, Pennsylvania. There are many Georges buried in Greenwood cemetery. Unfortunately, none of them are his siblings or parents. A general search of FindaGrave.com for the father, Simon George, in Indiana County, Pennsylvania came up empty. Strike three. I was beginning to think that the whole family was hiding behind a new husband's surname not just potentially Lydia. Sometimes census enumerators wrote all the children down with the surname of the head of the household. They weren't helping descendants and future genealogists! I focused in on Jacob, the only son, and my direct ancestor. I constructed searches with varying information such as a last name and a birth year. And then simply Jacob with a birth year (plus or minus a few years). I had to carefully scan every entry looking to find the other members of the family - mother, Lydia and sisters Sarah, Ann and Susan. There in the 1860 US Federal Census I found Jacob Murphy born about 1847 listed in the household of Jacob Murphy, head, in Brush Valley. Ironically you might think they were father and son because of their sharing the same name. The rest of the household had wife Lidia (lesson to me to be more careful to look for misspellings! ), Sarah, Ann, Susanna and one year old (what looks like) Bullian Murphy. I would imagine the name were really William Murphy but the enumerators Bs and Ws are clearly different on the page. So it appears that Lydia George got remarried to Jacob Murphy sometime between 1857 and 1860. I was relieved to finally solve the mystery of Lydia and her family in the 1860 census. But one mystery leads to the next. As quickly as they are found, they disappear. Jacob Murphy, Lydia and 1 year old son disappear and are no where to be found in the United States in the 1870 US Federal Census. That's another mystery for another day. Some day I will discover when and where Lydia died. Today's genealogy databases and search engines are very good but they can't make up for errors written into the census. If you are having difficulty finding your ancestors get creative with the spellings of their names (or "loosen" up the search parameters so that you don't search for "exact") or consider that, like in my case, they were hiding under a different surname. Any time there are mixed families in one household this can happen. Not just with second families but also with households that contain grandparents and grandchildren with different surnames. In this case, stop focusing on the surname and search instead for the first name and a birth date. How would you have solved my dilemma? What tricks do you have up your sleeve for finding missing ancestors in a census record? 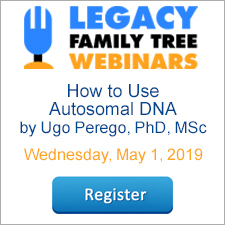 Marian Pierre-Louis is the Online Education Producer for Legacy Family Tree Webinars. She hosts the monthly evening webinar on the second Tuesday of each month. She is also the host of The Genealogy Professional podcast. Her areas of expertise include house history research and southern New England research. Check out her webinars in the Legacy library. At last week’s RootsTech conference MyHeritage announced a new dna tool called the Theory of Family Relativity. According to their announcement “Through this new feature, we provide you with leads explaining the relationship between your matches based on our entire collection of family trees and historical records, removing the guesswork, and saving you hours of research time." I thought I’d take a moment to put the new feature to the test with my dna results. I found the Theory of Family Relativity Tool by clicking on the DNA link at MyHeritage and then selecting DNA Matches. Next click on the pink View theories button. I have five dna matches that have a Theory of Relativity. My first three matches are distant cousins that I have previously messaged and we have been able to determine how we are connected. The MyHeritage Theory of Relativity matches up exactly for those matches. The third, though known to me already, is of great interest because we are both from a brick wall line. MyHeritage shows us preview information about the theory (see image below). Interestingly enough the shared surnames shown, Johnson and Shaw are not how we are connected. In fact, his descent from our common ancestral couple is not included on his tree at all. That branch of the family is left off. And yet MyHeritage was able to piece our relationship together anyway. The image below shows that the Theory of Relativity predicts that we are 3rd cousins once removed, which is accurate. In order to view the actual Theory I needed to click the View Theory link which is pink and admittedly very small. I would like it they could make that just a little bit bigger. So how did MyHeritage figure out our connection? It compared my tree to a tree found on FamilySearch. I believe what the algorithym did in this case was to combine information from a FamilySearch tree, the tree of someone who also shared ancestors with my dna match and finally with the very limited tree of my dna match. I can only imagine how that gets processed behind the scenes. Given that there was no direct online link between us other than our shared dna I'm impressed that the Theory of Relativity figured it out. I have two more Theory of Relativity matches to check out. I don't know yet how we are connected so I'll likely start with the suggestions from MyHeritage and see if I can prove or disprove the connections. So far, with three Theories proven as correct and two left to be determined I'm off to a pretty good start. Check our your Theory of Family Relativeity results at MyHeritage by checking the DNA matches section of your account. Marian Pierre-Louis is the Social Media Marketing Manager for Legacy Family Tree. She is also the host of The Genealogy Professional podcast. Her areas of expertise include house history research and southern New England research. Check out her webinars in the Legacy library. Back in July I was contacted by a distant cousin. He found me through a blog post I had written that had mentioned my 3rd great grandmother, Pleasant Ann Clawson. I was elated to receive his email. This was my first contact with another Clawson descendant. But I was feeling somewhat apprehensive as well. You see, Pleasant Ann Clawson was my second most stubborn brick wall. I wasn't sure what I'd be able to tell my new cousin. I've been researching Pleasant Ann for about 12 years. She was born in 1823 in Indiana County, Pennsylvania. She died in 1902, four years before the start of the Pennsylvania death certificates, and took the secret of her parent's names with her. My biggest problem, besides lack of records in early Pennsylvania, is that the Clawson family is very large! My strategy was to start with the very early censuses, find the heads of households and recreate the families. After that I tried tracking down land and probate records for the best male candidates. Nothing came of it. My best clue to sorting out these Clawsons was the 1860 US Federal Census where Pleasant McClarren (her married name), age 30, was found right next door to James Clawson, age 35, and family. I spent my efforts trying to chase James Clawson's family tree but never figured out who his parents were either. What was I going to say to my new cousin? I was still mulling over my response in January when MyHeritage came out with a chromosome browser for their dna results. I took a much keener interest then and started to really dig deep into the tools provided with the dna. I found I could do a surname search and on a whim searched for Clawson. What did I find but a dna match that was a direct surname descendant of the Clawsons! Before getting too excited I realized the match only had a tree for himself, his father and grandfather. I would not be deterred. If searching in the 1800s wouldn't bring results then I would start with an unfinished tree that is proven to be tied to me through dna. And so I started researching someone else's tree! Recreating the tree of a known dna match proved to be a much easier task. Perhaps being descended from a male Clawson instead of a female Clawson made finding records easier. Without too much trouble I made it back to William Clawson (1815-1888) and who was very conveniently brother to James Clawson (abt. 1825-1890), the same James who lived next door to my Pleasant in 1860. My philosophy about solving unknown parentage brick walls is that it is a two-step process. First you determine who the probable parents are and then you prove that you have the right parents. I used this exact same process with Geoff's Nathan Brown brick wall. So far, because of this dna match, I have determined a likely candidate for the family of my Pleasant Ann Clawson - John Clawson and his wife Elizabeth Wincher (with sons William and James among other children). A nice gaps exists in 1823 right where my Pleasant would fit into the birth order. With step one finished let's hope it won't be too difficult a process proving that I have the right family! I was recently reminded of a simple yet effective tip for bringing down brick walls. Yesterday one of my DNA matches contacted me suggesting that we might be connected through the Bair family. That got my attention because the Bairs are one of my brick walls. Before I go any further, let me tell you that I am an ancestral DNA addict! Not because I think that there is a magic DNA bullet that is going to bring down my brick walls, rather because it might provide the simplest hint that I hadn't seen before. That hint, combined with good old fashioned genealogy research is what solves mysteries. My new cousin shared her online Ancestry tree with me so that I could see where we might connect. She had already taken a look at my tree. She pointed out that "My Bair's were in Tuscarawas Co., OH, for a time, and Anna Bonfield that you have in your tree died in Tuscarawas Co." She continued, "I would think based on shared DNA our match would be a good ways back, so we just mightn't find it, but it still would be interesting to see if your Bair's relate to the Tuscarawas Bair's." Anna Bonfield is not a Bair so at first I discounted that. Too hasty, of course! Anna is married to a Bair - my third great grandfather, Jesse Bair. I decided to look at the information I had on Jesse Bair. Jesse Bair was born 11 Nov 1814 in Adams County, Pennsylvania. Further scanning of his life showed locations such as Stark County, Ohio; St. Louis, Missouri; and St. Clair, Illinois. Jesse's adult life is pretty clear to me but his parents and roots in Pennsylvania are a mystery. His wife's death in Tuscarawas, Ohio was nagging at me. So I went to my Legacy database and did a search for all individuals whose death place or birth place contained Tuscarawas. I didn't bother with listing towns or a state because Tuscarawas is such a unique name. I then selected Create List. The results brought up, as expected, Anna Bonfield, but also her son James K.P. Bair. A quick peek at his profile showed that he was born in Dover, Tuscarawas, Ohio. I was so focused on my ancestors that I forgot to look at collateral relatives! James is the brother of my second great grandmother, Anna Elizabeth Bair (1850-1881). James' birth places my ancestors right in the same location as the ancestors of my new distant cousin. Her Jonas Bair married and raised children in Tuscarawas, Ohio for twenty years before heading further west. It places him in the town of Dover exactly at the time my Jesse Bair was there. Surprise! James K.P. Bair was born in Tuscarawas County Ohio. What was my big mistake when researching my Bair brick wall? Not checking each location for other families of the same name! A quick search in the 1850 census for Tuscarawas County, Ohio revealed over 150 Bairs! I'm only concerned with the oldest generation from Pennsylvania so I narrowed down my search to those born in Pennsylvania. That brought 26 Bairs to my attention ranging in birth dates from 1791 to 1828. That date range means there's potential that Jesse's father could be hiding in plain sight in Tuscarawas County! I haven't brought down my brick wall yet. My next task is good old fashioned genealogy research. I need to recreate the Bair families in Tuscarawas County. Yes, it will be a lot of work but if it helps me find parents or siblings for Jesse Bair then it will be worth it! For more brick wall tips check out "Ten Brick Wall Tips for Beginners" in the Legacy library. Often times the large database providers like FamilySearch, Ancestry and FindMyPast will release a really big database that encompasses an entire state or maybe even a whole country. The dates of the database look promising - perhaps you'll see 1610-1950. You think "Perfect, my ancestor should be in there!" But then you search and you don't find them. What on earth is going on? First the date range of the database. Let's take a look at the Ancestry database "Rhode Island, Wills and Probate Records, 1582-1932" as an example. You think to yourself, and rightly so, "But Rhode Island didn't exist in 1582!" From what I understand (and please correct me if I'm wrong) is that it is a standard practice of archivists to title or name a date range so that it encompasses the entire date range found in a record set rather than the logical and expected date range of the jurisdiction (in this case Rhode Island). So for instance, if a record from London, England from 1582 gets recorded in the Rhode Island probate records in 1685 then it is included as part of the date range of the database record set. Don't worry about the date range of the database. That's actually the smaller of the two issues. The second issue, and this is the really important one, is that big databases are really made up of a bunch of smaller databases. You will encounter this in most state databases especially when the individual counties have started recording at different times. Let's take a look at the "Rhode Island, Wills and Probate Records, 1582-1932" database again. If you go straight to the Search box and type in your ancestor's name you may be frustrated when they don't turn up in the results. A better approach is to "browse" the database information before using the search feature. You'll find the browse feature on the main page of the database on the right hand side. It says "Browse this collection." Click on the arrow to the right of the word "Choose" and you will find a county list. Select the county that your ancestor lived in. What you'll soon discover is that there are different date ranges for each county. See these examples for Bristol County, Rhode Island and Providence County, Rhode Island. By determining the date range for your target county through the browse feature you'll be able to figure out in advance whether your ancestor is likely to be included in the database. Knowing that your ancestor's 1685 will is not included in the Bristol County database will save you the frustration of many futile searches. It's important to keep in mind that there are at least two considerations impacting the date range of any given county. When you search databases in any of the original colonies you have to consider that counties were formed, divided and re-formed over time. One county may have been formed in the 1600s and another in the 1800s. You really need to understand when counties were formed to know where to find the records you were looking for. For instance, Norfolk County, Massachusetts was founded in 1793. Records from 1793 to the present will be found in Norfolk County. Records before 1793 will be found in Suffolk County, Massachusetts. The other consideration is that regardless of when a county was formed they may have started recording records at different times from other counties in the same state. What's even worse is it may vary from town to town. You can use a tool such as the Research Guidance feature in Legacy Family Tree software as well as research guides such as the FamilySearch Wiki to find out what records were created when for the place where your ancestor lived. The next time you use a large online database don't get frustrated when your ancestor goes missing! Take charge by understanding specifically what records are included in the database for your specific county. For more research strategies from Marian Pierre-Louis see her classes in the Legacy Webinar Library. Need a time-saver for chasing distant relatives? Here's a social media tool that making tracking folks down a little quicker! This week on Webinar Wednesday, Lisa Louise Cooke presented "Tap Into Your Inner Private Eye - 9 Strategies for Finding Living Relatives." (Catch the free replay while you can!) This webinar discussed the many ways you can track down living people, particularly distant cousins who may have information about your ancestors. Lisa discussed many online tools one of which was called Social Searcher. According to their website, Social Searcher "allows [people] to search for content in social networks in real-time and provides deep analytics data. Users can search without logging in for publicly posted information on Twitter, Google+, Facebook, Youtube, Instagram, Tumblr, Reddit, Flickr, Dailymotion and Vimeo. Free users can also save their searches and set up email alerts." In essence this is a time-saver tool. Instead of searching a number of social media sites individually you can use Social Searcher to search all of them at one time. However, when I put my name in quotations - "Marian Pierre-Louis" - the results improve greatly. The phrase now appears in the exact phrase box on the left rather than the keywords box. All of the results related to me. When scrolling down the results you see social media posts that I've shared or interacted with on Google+, YouTube and Twitter. Not everyone is going to have as unique a name as I have. What do you do if distant cousin is named John Smith? Try searching for the name in quotations plus additional word(s) such as a location, occupation or school. I tried searching for my name plus the word genealogy. This time, instead of typing into the white search box I typed directly into the yellow search parameters boxes on the left side of the screen. I typed genealogy into the keywords box and Marian Pierre-Louis into exact phrase box beneath it. Then I used the orange search box at the bottom. The white search box was then updated with genealogy OR "Marian Pierre-Louis." That's not exactly what I was hoping for. I manually changed the white search box to genealogy AND "Marian Pierre-Louis." I tried variations on the search terms. Social Search seems to return the best results when you put the most important term first. So changing my search to "Marian Pierre-Louis" AND genealogy gave better results. You'll have to do some experimenting to get the best results for your searches. Click on the Advanced options header midway down the screen on the left. This will provide new options such as post types (links, photo, status or video), language and social media sites. Social Searcher may take a little experimenting to get your searches right but it is definitely a time saver if you want to search for distant cousins online across multiple social platforms. Keep in mind that the results only return publicly accessible social media posts and interactions. You'll have to return to more traditional methods if it appears that your distant cousin doesn't have an online presence. Give Social Searcher a try and have fun! We've tallied the numbers and made a list of the Top 10 Legacy Family Tree Webinar classes for November 2015! Are your favorite topics or instructors among the list? Need something new to learn? Use the list to get inspired! Each month thousands of Legacy Family Tree Webinar subscribers head for the library to learn new skills and techniques to help improve their genealogy research. Among the now-283 genealogy classes in the library, these were the most frequently played during the month of November 2015. They aren't necessarily the newest classes but rather the topics that were sought out by our members. 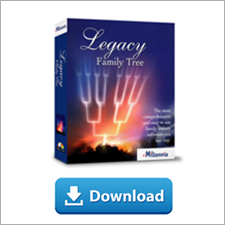 The classes in the Legacy Family Tree Webinar library are a members-only benefit. Not a member? Become one! Or watch the recording of the latest live class which is always available for free for a limited time!